NYC, 04/22/2019, 11:00AM. Aquaman (2018): Underwater Kingdom Heir Coming To Land. 143 min. Director: James Wan. Starring Jason Momoa, Amber Heard, Willem Dafoe. 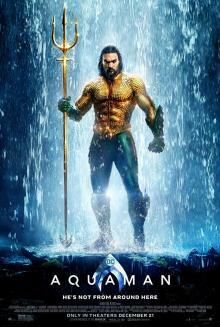 Aquaman grossed over $1.1 billion worldwide, becoming the highest-grossing film based on a DC Comics character, surpassing The Dark Knight Rises; it was also the fifth highest-grossing film of 2018 and 20th highest of all-time.